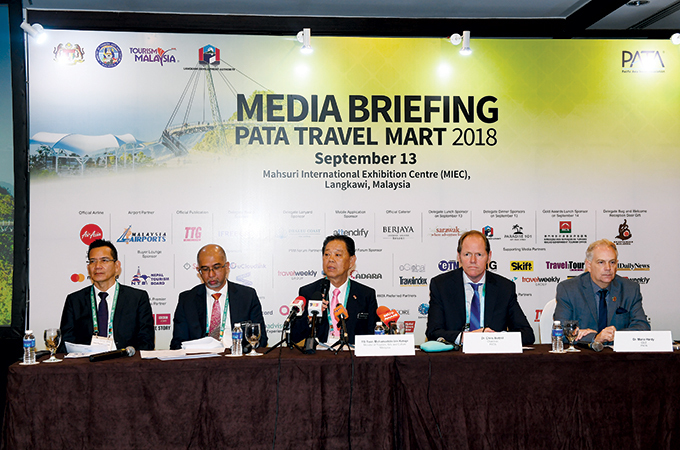 Over 1,400 delegates from 70 countries attended the PATA Travel Mart 2018 (PTM 2018), which was hosted by Malaysia and held at Mahsuri International Exhibition Centre (MIEC) in Langkawi, Malaysia, last month. The three-day event registered a total of 389 sellers from 208 organisations and 33 destinations with local sellers comprising 32 per cent of the total, along with 252 buyers from 241 organisations and 53 source markets. The international event officially opened in Langkawi, Malaysia on September 12 with the PTM 2018 welcome reception, presided by the Right Honourable Dato Seri Dr Wan Azizah Dr Wan Ismail, Deputy Prime Minister of Malaysia, taking place at the Langkawi International Convention Center (LICC). Malaysia had last hosted PATA Travel Mart (PTM) in 1986 and 2005. It has now returned, this time, to the beautiful island of Langkawi, which is being positioned by the country as a top-of-mind destination. Last year’s tourism performance saw Malaysia welcoming a total of 25.9 million tourists with RM82.2 billion ($19.8 billion) in receipts. It is now targeting to grow to 30 million arrivals and tourist receipts to reach RM100 billion ($24.1 billion) by the year 2020. “Moving forward, our direction for 2018-2020 is to optimise digital marketing; focus on industry collaborations; leverage on major events for publicity; also leverage on mega projects coming on board in Malaysia; integrate our marketing campaigns with other Government agencies; and promote Malaysia as a filming destination,” the minister added. “We are optimistic that the tourism industry will flourish in light of upcoming infrastructure and facilities developments, our promotional and marketing strategies for 2018 until 2020, and support from the Government and private sector,” he said. The Pacific Asia Travel Association (PATA) also welcomed 210 local and international young tourism professionals including PATA Student Chapter members from Bangladesh Dhaka University, Canada Vancouver Capilano University, Malaysia Taylor's University, Nepal, Philippines LPU-Manila, and Singapore Temasek Polytechnic. The students were part of the PATA Youth Symposium, hosted by the Langkawi Development Authority (Lada) and the Alumni Association of UiTM Students' Representative Council (PIMPIN) in collaboration with the PATA Malaysia Chapter, Tourism Malaysia and Langkawi UNESCO Global Geopark. Delegates also had the chance to gain insights into product development, machine learning, data analytics and artificial intelligence at the Travolution Asia Forum 2018, organised in partnership with Travel Weekly Group. Furthermore, for the first time at PTM, the world’s 15 most innovative travel and tourism start-ups pitched their business models to a jury panel at the World Tourism Forum Lucerne (WTFL) Start-Up Innovation Camp 2018.